The ideas of bringing out such a document have been shaped by several Ghorakhalians with whom I had the opportunity to interact with, from time to time. In addition, the members of earlier OBA committee continue to be a source of encouragement. I thank the members of the outgoing OBA committee for their dedicated work. Results of their work have been the source of a number of useful inputs in writing this document. In strict terms it may not be called a vision document. However, a sincere attempt is being made and a small beginning has been made. While preparing this document we realized the magnitude of various detailed activities starting with the manuscript. This document wouldn,t have taken shape without the sincere, untiring and dedicated efforts put forth by the members of OBA, Bareilly chapter in general and col Ajay Dixit and Dr. Ajay Sahani in particular .We also thank all the ladies of members of the Bareily chapter who have been a great source of strength through their affection, and tender care and through the candid expression of their insights in real life situations. It was the vision of Wg Cdr Jaimal Singh first Principal of SSGK supported by subsequent principals of SSGK which gave the opportunity for this nascent institution SSGK in 1965 to develop in the present day great institution, the mother of this association called OBA. In early 65 many in SSGK must have considered this an unattainable dream. What followed was a shared mission. Every student in the school believed that they were born to realize that the school could be converted into a great institution of repute and learning. It is gratifying to note that the vision in relation to developing SSGK into a great institution has come true now specially in terms with infrastructure and sending student to premier institution like OTA, NDA, IMA in gen and Armed forces in particular and other coveted walks of Civil life. However the vision of a OBA body with strong bonding, self reliance and self containment in terms of infrastructure, organization and management still remains just partially realized. 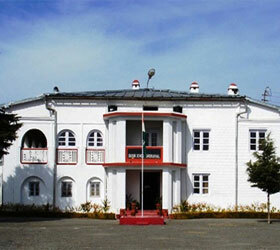 The school has completed 45 yrs of existence. Every year 60-80 students are added to the school and 60-80 pass out. What vision can they have ? should we like some question the very concept of OBA and leave vast majority of OBA members to the same condition of stagnation which has existed for decades of think only of the upper strata of OBA members who hold OBA meet here and there and leave the rest to their fate employing such nice sounding phrases as alma matter, school sprits, ex Ghorakhalians OBA etc or leave the initiative to local chapters. Where should we see OBA and its member going in next decade or so ? As the present OBA President, I have been fortunate to have been associated with a large number of Ghorakhalians who were interested in posing these questions and finding some answers. These came substantially through a novel organization, called OBA which has lunched a major exercise called OBA Vision 2015. Formation of committee to be called as panel, to deliberate on various issues and the draft reports to be submitted by the various chapters (Task Force). Participation of vast majority of ex Ghorakhalians. Preparation of questionnaire and other inputs. Traval and interact with ex Ghorakhalians in variegated parts of the country. Disclosuer of few action plans which need to be launched immediately. Seek views and guidance from Retd teachers, Principals, Registrars & Head Masters of the school. Seek inputs from task forces (i. e. Various chapters).